Orville presents this fiddle tune entitled "Texas Gales." 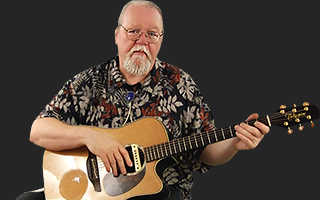 This song lesson offers an opportunity to work on right and left hand synchronization as well as flatpicked melody lines. You are an absolutely amazing teacher. Your styles helps me wrap around a song in no time. Thank you so much for your patients. The longer you take to explain the faster i can learn. I'm thankful for every second you spend pouring yourself into these videos. May God bless you and the works of your hands. Orville Johnson teaches a select group of his favorite songs, including a few originals. Orville Johnson teaches his version of the classic blues song "Come Back Baby." Orville Johnson teaches a classic blues song entitled "Depot Blues." This lesson was inspired by the blues great Son House. Orville Johnson teaches the traditional blues song "Railroad Bill." Orville teaches the classic blues song "Bye Bye Baby Blues" by Little Hat Jones. Orville Johnson teaches the classic "Spanish Fandango." Orville Johnson teaches a classic song entitled "A Bicycle Built for Two." This song is also known as "Daisy Bell."